Thulium is a rare earth metal never found in as a free element. It is found in small quantities with other rare earths in minerals such as monazite. In pure form, this metal has a bright, silvery lustre. Thulium is reasonably stable in air, but must be protected from moisture. The element is silvery-grey, soft, malleable, and ductile, and can be cut with a knife. 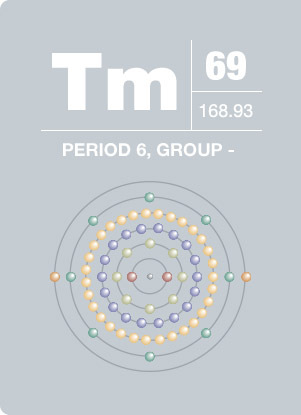 It currently has no commercial applications, although one of its isotopes, thulium-169, could be used as a radiation source for portable X-ray machines. First identified in Sweden by chemist Per Theodor Cleve, Thulium gets its name from the ancient name for Scandinavia, Thule.